NO PURCHASE NECESSARY TO ENTER OR WIN. OPEN ONLY TO LEGAL RESIDENTS OF THE CONTINENTAL UNITED STATES, 18 YEARS OF AGE OR OLDER. VOID IN PUERTO RICO, OVERSEAS MILITARY INSTALLATIONS, OTHER US TERRITORIES AND WHERE PROHIBITED BY LAW. 1A. Promotion Concept. 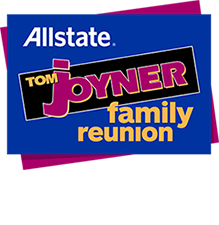 Each morning, Tom will announce that the Home Depot is awarding a Grand Prize Getaway package for (1) one winner to attend the Allstate Tom Joyner Family Reunion. Listeners will be encouraged to log-on to BlackAmericaWeb.com for a chance to win a getaway for a family of up to (4). The winner will be randomly selected from the pool of eligible entries, entered each day of the promotional period. 1B. Promotion Period.The Promotion begins at 5:00 AM CT on Monday, August 7, 2017 (“Inception”) and ends at 11:59 PM CT on Sunday, August 20th, 2017 (“End Time”) (“Promotion Period”) unless otherwise extended or terminated by Administrator. 1C. Sponsor.The Home Depot Co, Inc. (“Home Depot”). 2. HOW TO ENTER CONTEST PROMOTION. 2A. Participants may enter the “End of the Summer Celebration” promotion by logging onto the BlackAmericaWeb.com website and following the click through banners that directs them to a unique landing page. Listeners register to win by entering their contact information including name, address, phone number and email address for a chance to win (1) one Grand Prize getaway. In addition, they will acknowledge they have read the and agree to abide by the same. 3. SELECTION OF DAILY PRIZE WINNER.Prizing will be awarded once during the promotional period, August 7th – August 20th, 2017. Winner will be randomly selected by the Administrator from the pool of all eligible entries submitted during the Promotional Period. Should a Grand Prize Winner not be validated, an alternate may be selected. Winner will be selected before 5:00pm CT on Monday, August 21st. Details of the Grand Prize, subject to change include: five (5) days, four (4) nights of accommodations at Gaylord Palms Resort & Convention Center for up to four (4); single day tickets to one (1) theme park for up to four (4) people, including (2) Two Dinners, and (1) One Breakfast, for up to (4) four people, and Friday, Saturday, and Sunday (space may be limited for some activities and will be based on a first-come basis), ground transportation from the Gaylord Palms Resort and Convention Center to the participating theme park. Air fare is not included in the Grand Prize. Winner is not entitled to the difference between the approximate retail value and the actual value of the Grand Prize. 5. RULES.The General Promotion Rules (as detailed below) are part of these Official Rules. Should the Detailed Promotion Rules conflict, the Detailed Promotion Rules shall prevail. ADMINISTRATOR AND PROMOTIONAL ENTITIES.The “Administrator” for the Promotion is Reach Media, Inc. (“RMI”), 13760 Noel Road, Suite 750, Dallas, Texas 75240. The Sponsor is as defined under the “Detailed Promotional Rules” or, if undefined, is the advertising sponsor that initiated the contest. The “Promotional Entities” are, collectively, the Administrator, the Sponsor, the Prize Provider, The Tom Joyner Morning Show®, and affiliate radio stations of The Tom Joyner Morning Show® and each of their respective parents, subsidiaries, affiliated companies, promotional partners, and their advertising and promotional agencies. PROMOTION CHANGES.Administrator reserves the right to make changes in the rules of the Promotion at its sole discretion at any time without notice. REPRESENTATIONS and WARRANTIES. Each Participant represents and warrants as follows: (i) the Entry is the Participant’s own original, previously unpublished, and previously unproduced work; (ii) the Entry does not contain any computer virus (as applicable), is otherwise uncorrupted, is wholly original with Participant, and as of the date of entry, is not the subject of any actual or threatened litigation or claim; (iii) the Entry does not and will not violate or infringe upon the intellectual property rights or other rights of any third party; and (iv) the Entry does not and will not violate any applicable laws, and is not and will not be defamatory or libelous. Participant hereby agrees to indemnify and hold the Promotional Entities harmless from and against any and all third party claims, actions or proceedings of any kind and from any and all damages, liabilities, costs and expenses relating to or arising out of any breach or alleged breach of any of the warranties, representations or agreements of entrant hereunder. GENERAL ELIGIBILITY RESTRICTIONS.This Promotion is subject to all federal, state and local laws and regulations. Unless otherwise defined in the Detailed Promotion Rules, this Promotion is offered and open only to legal U.S. residents of the 50 United States and the District of Columbia, eighteen (18) years of age or older. Promotion is void in Puerto Rico and where prohibited by law. In any sixty (60) day period, only one (1) prize per household is allowed. Any prize won by the same individual, or by different individuals in the same household, beyond the first will be forfeited. “Household” shall include: (i) persons living at the same street address, either full or part time, whether or not such individuals are legally related and (ii) persons living at different street addresses that are related by birth or marriage. For clarification, if Promotion provides for multiple prizes, the winning of any one prize precludes the winning of any other. Employees, officers, directors and agents of the Promotional Entities; REACH Media; The Home Depot, their immediate family members (spouse, domestic partner, parent, child, sibling and their respective spouses), regardless of where they reside; and those living in their same households (whether or not related) are not eligible to enter. OFFICIAL WINNER VALIDATION.In order for a potential winner to become an official winner, the Administrator must verify: (i) that the entrant was eligible to enter, (ii) that the potential winner was eligible to win the Promotion, and (iii) that the potential winner completed and returned any required documentation (as specified under “General Requirements to be Official Winner”). Unless otherwise specified in the Promotion or the documentation package sent to the potential winner, documentation must be returned within ten (10) days of receipt; otherwise, the potential winner is disqualified. Prize(s) will be awarded to potential winners only after validation, which shall be determined by the Administrator, in its sole discretion and which shall be deemed final. A potential winner may decline a prize by notifying the Administrator or by not returning the required documentation in the specified time. In the event any winner is found to be in violation of these Official Rules, they will be required to forfeit prize or to reimburse the Prize Provider for the stated value of a prize if such violation is found after the prize has been used by winner. Unless otherwise specified in the Promotion, should a potential winner not be validated, an alternate winner will not be selected. GENERAL REQUIREMENTS to be OFFICIAL WINNER.Potential winners may be required to complete, execute, and return a documentation package within ten (10) business days (or such period as specified in the Detailed Promotional Rules) sent to potential winners prior to the acceptance of the prize. Such documentation package may include an affidavit of eligibility, a liability release, a publicity release, an IRS Form W‑9, a non‑disclosure agreement, and such other documents as necessary. Some documents may require that the potential winner’s signature be notarized. Appropriate identification (including proof of U.S. residency) is required for all prizes. Failure to return complete and accurate documents in a timely manner, noncompliance with these Official Rules or return of a prize notification as non-deliverable, will result in forfeiture of the applicable prize. Odds of Winning.Unless stated otherwise, odds of winning depend upon the number of eligible entries received. Purchase of any products or services from Promotional Entities will not improve odds of winning. Forfeited Prizes.Prizes that are unclaimed, undeliverable, for which the potential winner has been disqualified, or for which the potential winner did not return their documentation as required will not be awarded unless another disposition is specifically identified in these Official Rules. Getaway Limitations. Unless otherwise provided, if a getaway is included in a prize, it is subject the provisions in this section. If the potential winner cannot meet the limitations of this section, the prize will be forfeited in its entirety. Getaway must be taken on dates specified by Prize Provider. Travel dates are subject to availability; blackout dates and restrictions may apply. Winner and guest(s) must travel together on the same itinerary, and all travel arrangements must be made through a travel agent selected by Prize Provider. If any segment of the getaway is outside the United States, winner and guest(s) are required to hold valid passports. Unless otherwise noted, prizes that include air transportation are subject to the following limitations: (i) if hotel accommodations are provided and the winner or guest(s) live within a 200-mile radius of the hotel selected by Prize Provider, winner or guest(s) will not receive the air transportation portion of the prize, and the prize package will consist of all other remaining elements; (ii) all air transportation is to and from a major airport in the continental United States; and (iii) if prize is provided by a carrier, the air transportation is limited to those airports served by such carrier. Each winner will be responsible for all gratuities, meals, ground transportation and any other incidental costs or expenses not identified in these Official Rules. Should a getaway or event be canceled due to force majeure, the prize will be canceled. Winners and guest(s) are encouraged to secure getaway interruption/cancelation insurance at their expense. RELEASES.All participants (entrants and winners), by participating in the Promotion, agree that Promotional Entities and the Intermediaries and each of their respective officers, directors, employees, independent contractors, salespeople, representatives and agents (collectively, the “Releasees”) are released from all liability whatsoever, and will be held harmless by participant, from and against and all claims, actions and/or liability for injuries, losses or damages of any kind to person, including without limitation, death and property, resulting in whole or in part, directly or indirectly from the acceptance, possession, use or misuse of the prize, participation in a Promotion-related activity, or participation in this Promotion. Participants acknowledge that Promotional Entities, nor Intermediaries, have neither made, nor are in any manner responsible for, any warranty, representation (including but not limited to, the correctness or accuracy of information posted on BlackAmericaWeb.com) or guarantee, express or implied, in fact or in law, relative to the Promotion. USE OF NAME AND LIKENESS.By participating in this Promotion, participants (entrants and winners) consent to the Promotion Entities’ use of their name, portrait, picture or other likenesses, hometown, state of origin, information from their entry, and voice in any and all media now or hereafter known (including on The Tom Joyner Morning Show® affiliate radio stations and affiliated web sites) for publicity, advertising and promotional purposes worldwide in perpetuity without additional compensation, notification or permission and without the right of review. Further, participants agree that Promotional Entities may contact entrants, winners, and their associates and disclose personal information obtained from them in this Promotion to affiliated entities and use this information for marketing and other purposes. GRANT of RIGHTS. For good and valuable consideration, the receipt and legal sufficiency of which is hereby acknowledged, Participant hereby irrevocably grants the Promotional Entities, their successors and assigns, a non-exclusive license (but not the obligation) to reproduce, publicly perform, stream, exploit and otherwise use the Entry throughout the universe, in perpetuity, by means of any and all media and devices whether now known or hereafter devised. The Promotional Entities shall have the right, in their sole discretion, to edit, composite, morph, scan, duplicate, or alter the Entry for any purpose which the Promotional Entities deem necessary or desirable, and Participant irrevocably waives any and all so-called moral rights they may have therein. The Promotional Entities shall have the right to freely assign its rights hereunder, in whole or in part, to any person or entity. Promotional Entities shall retain the rights granted in the Entry even if the Entry is disqualified. If Promotional Entities shall desire to secure additional assignments, certificates of engagement for the Entry or other documents as Promotional Entities may reasonably require in order to effectuate the purposes and intents of these Official Rules, then Participant agrees to sign the same upon Promotional Entities’ request therefore. LIMITS OF LIABILITY.Releasees assume no responsibility and disclaims all liability for any lost, late, incomplete, inaccurate, stolen, misdirected, delayed, mis-delivered or undelivered item sent by mail, courier, express, electronic transmission, or other delivery method. Lost prize checks will not be resent. The Releasees are not responsible for any incorrect or inaccurate entry information, whether caused by any of the equipment associated with or utilized in the Promotion, and the Releasees assume no responsibility for any error, omission, interruption, defect, failure, malfunction or delay in operation or transmission or any problems or issues related to the Internet related to the Promotion, or for any damage to participant’s or any third party’s phone lines, telephone systems wireless phone/handset or other device, problem or issues with cellular equipment towers, telephone systems or wireless services, Internet or for theft or destruction, tampering, or unauthorized access to entry information, or for entries, submissions which are late, delayed, misdirected, inaccurate, incomplete or, inaudible, disconnected (or any combination thereof) or in any other media for form, print or otherwise, or for preemption or cancellation of radio program, errors related to technical, network, typographical, Internet nomination, human or other errors or problems relating to or in connection with Promotion, including, without limitation, errors or problems which may occur in connection with the administration of the Promotion, the acceptance of the nomination forms, the announcement of prizes or in any Promotion‑related materials. If, for any reason, the Promotion is not capable of running as planned by reason of tampering, unauthorized intervention, fraud, technical failures, or any other causes which, in the sole opinion of the Administrator, corrupt or affect the administration, security, fairness, integrity or proper conduct of this Promotion, Administrator reserves the right at its sole discretion to cancel, terminate, modify or suspend the Promotion (or any portion thereof). Any attempt to defraud Promotional Entities, in any way, will result in disqualification of participant, and such participant will be prosecuted to the fullest extent of the law. IN NO EVENT WILL THE RELEASEES BE RESPONSIBLE OR LIABLE FOR ANY DAMAGES OR LOSSES OF ANY KIND, INCLUDING DIRECT, INDIRECT, INCIDENTAL, CONSEQUENTIAL OR PUNITIVE DAMAGES ARISING OUT OF YOUR PARTICIPATION IN THE PROMOTION. TRADEMARKS AND SERVICE MARKS.Any trademarks used in this Promotion are the property of the respective trademark owners and are used for identification purposes only. OTHER RULES AND CONDITIONS.Unless otherwise specifically noted, all times in these rules refer to Central Time. All headings contained in these Rules are for reference purposes only and shall not be deemed to limit, cover, or in any way affect the scope or meaning of these Official Rules or any part thereof. GOVERNING LAW AND VENUE.All participants (entrants and winners) agree to: (a) be bound by these Official Rules; (b) acknowledge that they agree that the laws of the State of Texas shall govern this Promotion, without respect to the Conflict of Law Doctrines; and (c) submit any disputes or conflicts to the courts of competent jurisdiction in Dallas, Dallas County, Texas.